Slim, light and sharp, Seiko's newest chunk of e-paper is almost book-like. The latest electronic paper from the labs of Seiko Epson in Japan is noteworthy for both its slim dimensions and its ultra-high resolution for displaying e-books downloaded from a PC via USB. 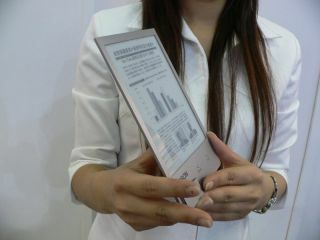 On show at the Embedded Technology 2007 exhibition in Japan, the prototype e-paper display is just 3mm thick and weighs 57g in spite of measuring 18 x 12cm - more than big enough to imitate a paper-based book. That said, however, the main trick of the monochrome display is its resolution of 1200 x 1600 pixels, which equates to 300dpi, or the approximate resolution of a printed magazine. In other words, reading from the device is going to feel close enough to reading from a piece of paper. The equivalent of turning a page is the redraw time - a figure that has been improved from 5 seconds in the previous generation to 0.7 seconds here, while the CR1220 watch battery that powers the unit should last for almost 1,500 such refreshes. Seiko Epson's technology is undoubtedly impressive, but we'll take an old-fashioned lump of dead tree over a machine that needs a new battery every other book any time.